Whenever someone mentions steakhouses, Peter Luger in Brooklyn is surely the first thing that comes to mind. Sure, it’s legendary status has people flocking from all corners (of New York at least) for some of their famous steaks. But just a few blocks north in Williamsburg, there’s a little place that’s a fraction of the size of Peter Luger that has quite a following of its own. 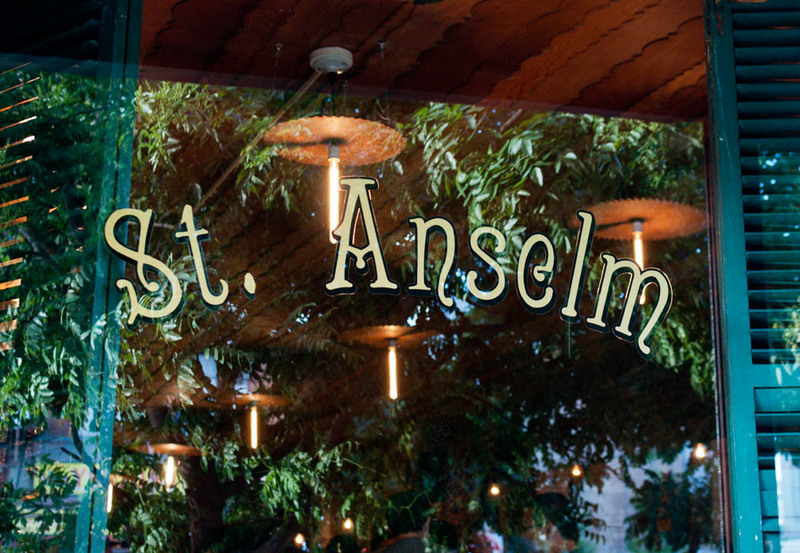 St. Anselm, the second iteration of the restaurant by the same name, is an understated neighborhood spot that can be so popular at times that wait times exceed over 2 hours. Even though I was unfortunate enough to experience the rather excruciatingly long wait times during one of my visits during prime hours on a Saturday night, the food and service more than made up for the wait. The low key dining room surrounds a long bar with an open kitchen where the food is fired up right in front of you. This made for a rather warm experience in the heat of summer but that’s nothing a chill glass of white wine on tap can’t fix. The service is friendly but brisk, nothing too fussy so you can really just sit back and enjoy. The menu here is simple with majority of the dishes prepared on a grill. Under the small plates from the grill section, I adore the three eggplants, Italian, Thai and Japanese, with fried goat cheese and caramelized onions. 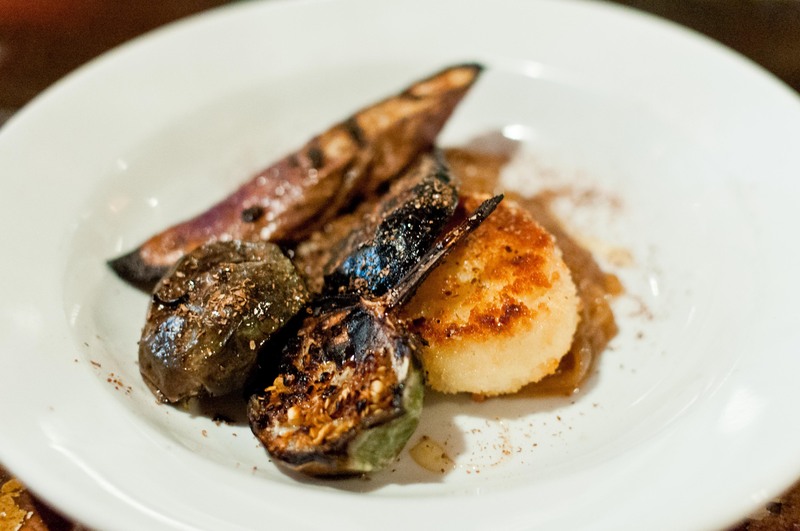 The sweet caramelized onion puree pairs so well with the tangy and creamy goat cheese and the smokiness from the eggplants. Even though you might not think that you would like grilled avocado, the avocado and shrimp salad appetizer might just make you change your mind. 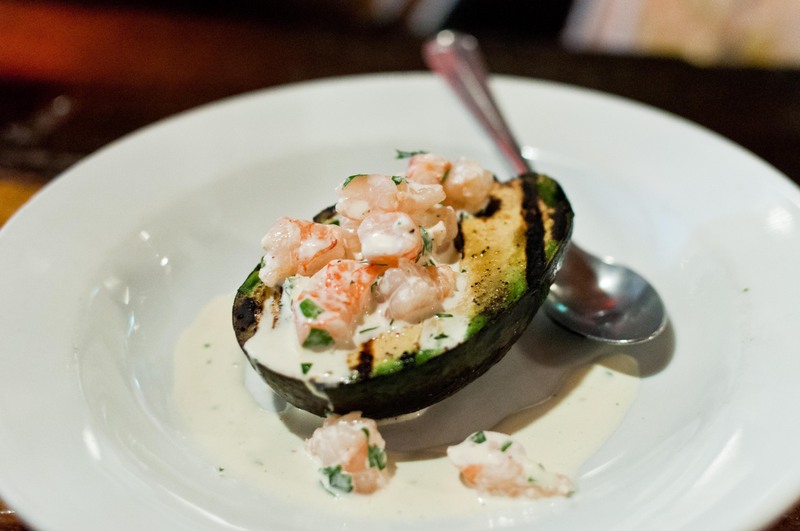 The sweet shrimp salad is lightly dressed with a tangy dressing and served in the half avocado. The avocado has been just lightly kissed by the hot grill, enough to impart a lovely char. 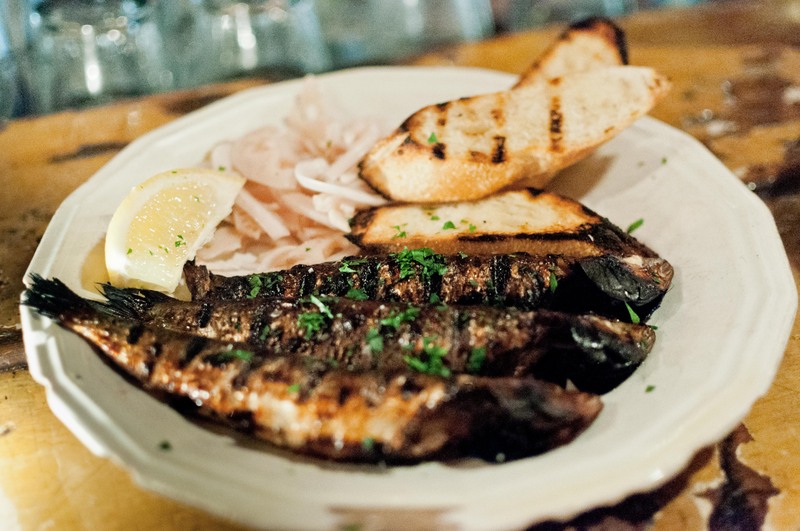 Of course, fresh sardines are a must try if you aren’t afraid of a few little bones here and there. Adding a little bit of the pickled onion and lotus root to the meaty fish perks up the dish right away. A lovely fresh version of canned sardine and Triscuit snack served at Prune in East Village. And for something a little lighter to start off the meal, there is a small salad selection for you to choose from. Well, I guess light if you consider grilled Haloumi cheese light! 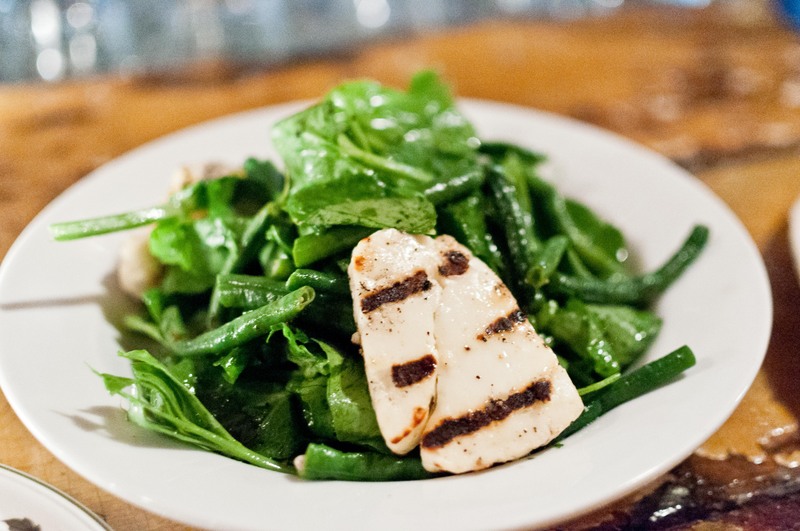 Two pieces are perched on top of a refreshing combination of pea shoots and long beans, dressed lightly in a lemon vinaigrette. And after fully experiencing the starter section, one can finally move onto the main attraction of a steakhouse, the steaks. St. Anselm offers various cuts of beef, from the quintessential New York strip steak to the bone-in ribeye that ranges from 35 oz to 60 oz. 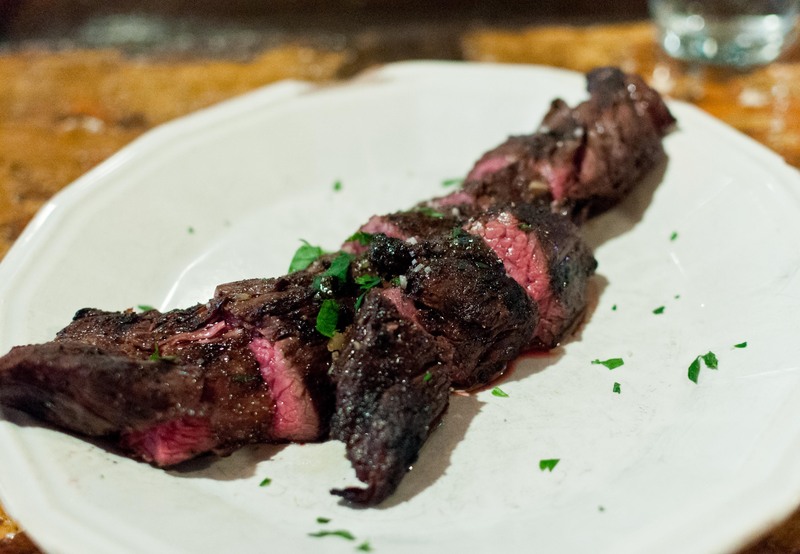 For those of us with a smaller appetite, the good news is that the signature cut at St. Anselm is a much more manageable butcher’s cut which is also known as hanger steak. This is one of the few places that actually understood my version of a medium rare. The pink all over meat with a salty charred exterior turns a slightly deeper shade towards the center, retaining all the juices and soaking in the garlic butter that is ladled on after the steak has been pulled off the grill. 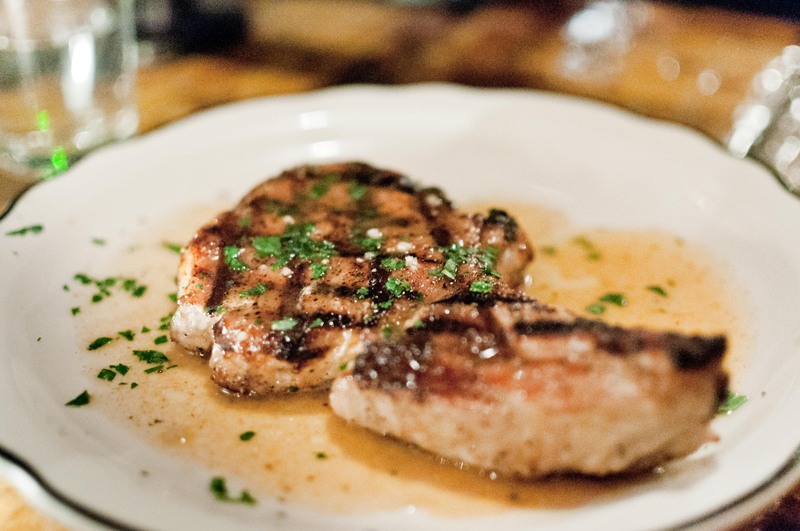 And even though St. Anselm is known for its butchers steak, their bourbon brined center cut pork chop puts up one hell of a fight. Beautifully seasoned and cooked to a perfect medium, the chops are moist and juicy. Each bite starts with a hint of Bourbon and ends with sweetness of the pork. In addition to beef and pork, St. Anselm also serves a few cuts of lamb. 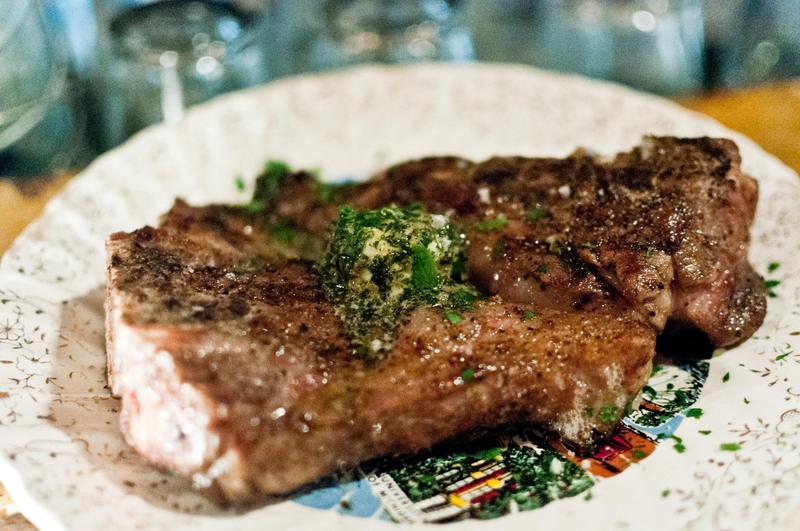 The shoulder blade chop, like all the other meats, is simply grilled and served with a mint gremolata butter. While this might look like it’s not for the faint of heart, there was actually quite a bit of fat and bones, rendering a good portion not quite suitable for eating. 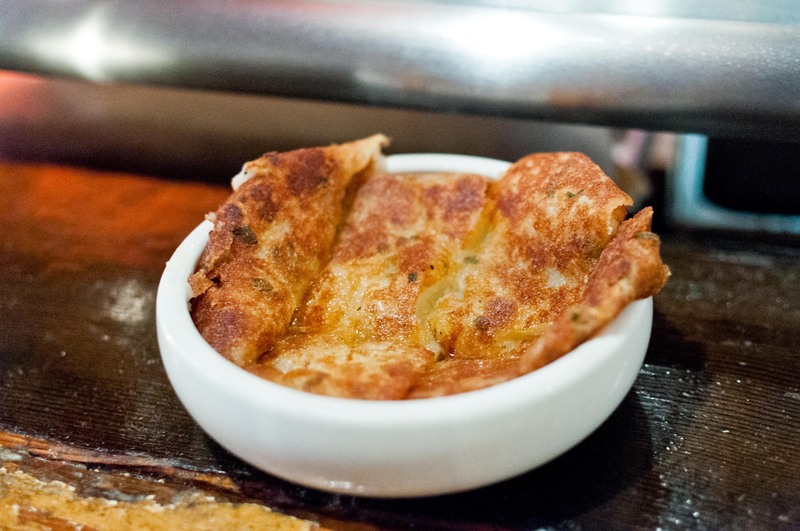 For a steakhouse, St. Anselm actually offers quite a few non fish items. At least five are available, ranging from salmon to scallops to mackerel. 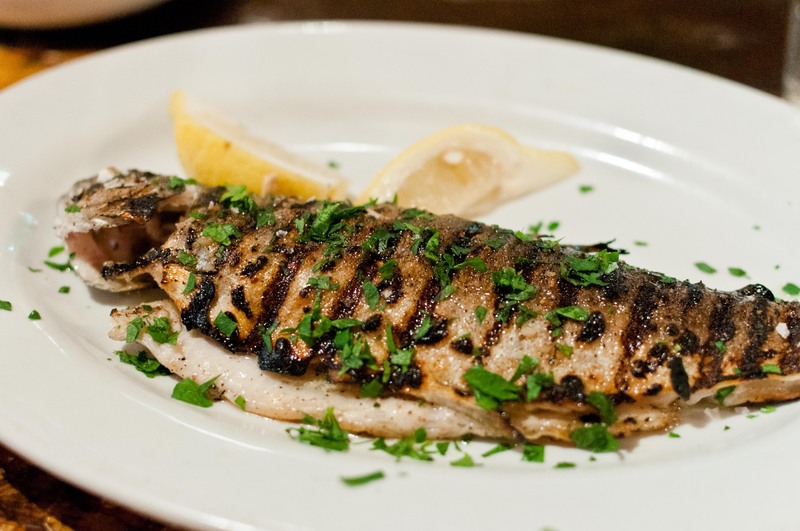 At the waiter’s suggestion, we sampled the whole grilled trout with lemon garlic. Sometimes, when the ingredients are so fresh, you don’t need much to make the dish amazing. You can just tell how much we enjoyed the fish by how cleanly we finished the trout, down to the bones. It pays to trust the waiter. Like a typical steakhouse, the bigger plates are served by themselves. This lets the diner pick and chose the sides that might speak to them. Now trust me on this, no matter what kind of mood you are in, orders of the spinach gratin and the pan-fried mashed potatoes with truffle oil should be placed. 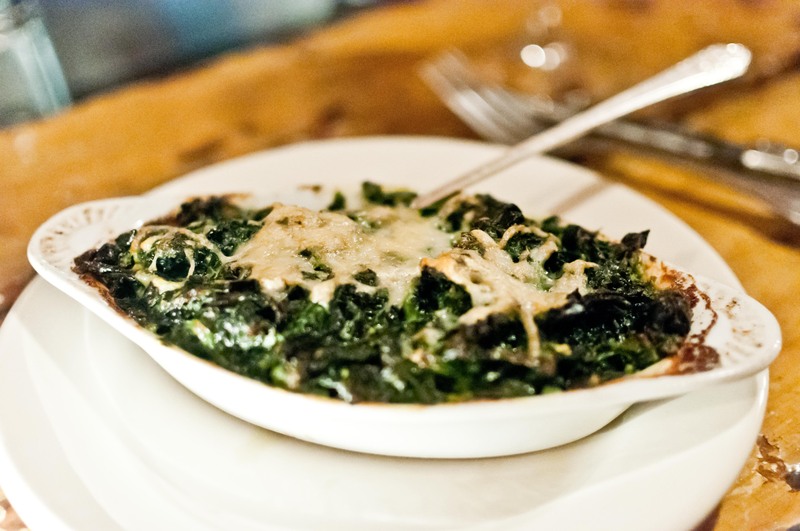 The spinach gratin is light on the cream and big on the leafy green goodness. The pan-fried mashed potatoes are the opposite and should be shared with the table, despite how much you want to keep the entire bowl to yourself. Neither of my visits here had resulted in room for dessert. This is how you know you have done it right here at St. Anselm. That said, I do vow to make it that last course one of these visits. After all, it took a lot to say no to a dessert two times in a row. Not sure I will have the will power to resist a third time, especially now I know of a place that will to be able to satisfy my steak and pork chop cravings and finish with a rich chocolate pots de creme.